New Press, The, 9781565843776, 399pp. 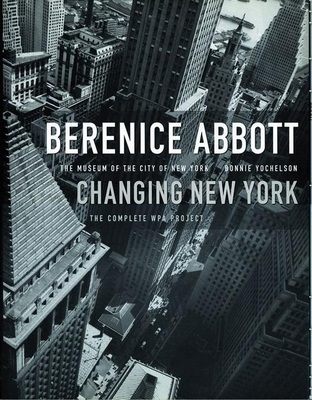 Originally published by The New Press in 1997 to stellar reviews and great acclaim, Berenice Abbott: Changing New York sold more than 20,000 copies in its combined editions and was featured in Vanity Fair, Newsweek, and the New York Daily News and called "the definitive visual record of the city as it was during the Depression" by the Washington Post. A Midwesterner who first came to New York in 1918, Abbott (1898-1991) was one of the twentieth century's most important photographers, and her images have come to define 1930s New York. In 1921, she moved to Paris and worked as Man Ray's darkroom assistant. Inspired by the great French photographer Eugene Atget, she returned to America in 1929 to photograph New York City. With the financial support of the WPA's Federal Art Project from 1935 to 1939, she was able to realize her ambition to document a "changing New York." This deluxe hardcover edition features more than 300 duotones--the complete WPA project--and 113 variant images, drawings, and period maps, as well as an explanatory text on Abbott's life and work. Bonnie Yochelson, formerly the curator of prints and photographs at the Museum of the City of New York, teaches at the School of Visual Arts, New York. The author of Berenice Abbott and a co-author, with Daniel Czitrom, of Rediscovering Jacob Riis (both available from The New Press), she lives in New York City.